What is the difference between your Duo, Mono, Solo and Euro Stormor Shelving? Double skin steel to make the upright, 1000kg weight per bay, more aesthetically pleasing with open or solid cladding available. With a wide range of accessories, you can store a whole range of items. 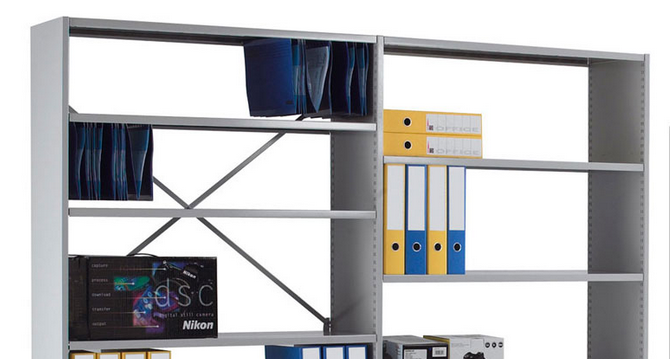 Open higher capacity upright, fully adjustable shelving consisting of metal shelves and open end metal frames. Each bay can hold 1000kg. One piece bay, with solid uprights, can add rear cladding to prevent any loose items from falling out of the back, lighter and heavier duty shelves available as well, holds up to 700kg per bay. Heavy duty fully adjustable steel shelving, like mono can be built to provide a two tier shelving system, used mostly for commercial purposes it can hold up to 2300kg per bay. All shelves and backs are completely interchangeable on the whole Stormor range. Which Industries typically use this shelving? The Mono and Duo ranges are fully adjustable, and come with an array of accessories making them ideal for offices, show rooms, retail and front of house. The Solo range with its closed sides and also the ability to have rear cladding added is great for archive storage, stockrooms, stationary and medical storage. And for our heavy duty range, Euro, with bay capacity of 2300kg and additional extra shelves available it's being used in warehouses, stock rooms, medical, and data storage. What can I store on the shelves and what accessories are available? You can store anything you like, as long as it doesn’t exceed the bay’s weight capacity. We have a vast range of accessories you can use with the shelves including; Dividers, garment rails, doors, pull out drawers, and bin fronts to name a few. You can also put our shelving units on tracks making them mobile; this means you can get up to 70% more storage out of your area as you only need a 3 metre walkway between the units to access your stored items. Can the shelves be extended if needed? Yes, you can buy extension bays which easily clip onto ‘starter’ bays we also sell height extenders, if this is something you are interested in please call our team on 0808 163 3704 to discuss in more detail. Can the shelving be used in hygiene sensitive areas? Yes, all shelving ranges are coated in Biocote, this reduces the spread of bacteria and is especially suited for medical establishments and cleans rooms etc. Pigeon hole shelving; can you have varied pigeon holes in one unit? Yes, the pigeon hole shelving is made using our Solo shelving unit, and you can buy the dividers to suit your needs, as long as they are all the same height you can vary the pigeon holes, the divers are also available in different heights as well. Yes, there are no nuts and bolt, everything clips into place, you may need an extra pair of hands to put everything together though.